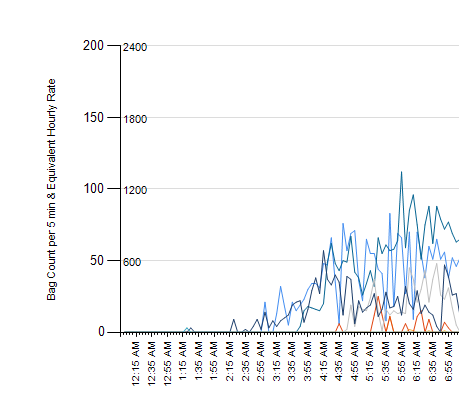 I was asked to create a graph showing throughput of bags on a conveyor grouped into 5 minute intervals. One of the requirements was to show two scales on the Y axis, bags / 5 minute interval, and the equivalent value in bags / hour. I.e. bags / 5 minutes * 12. 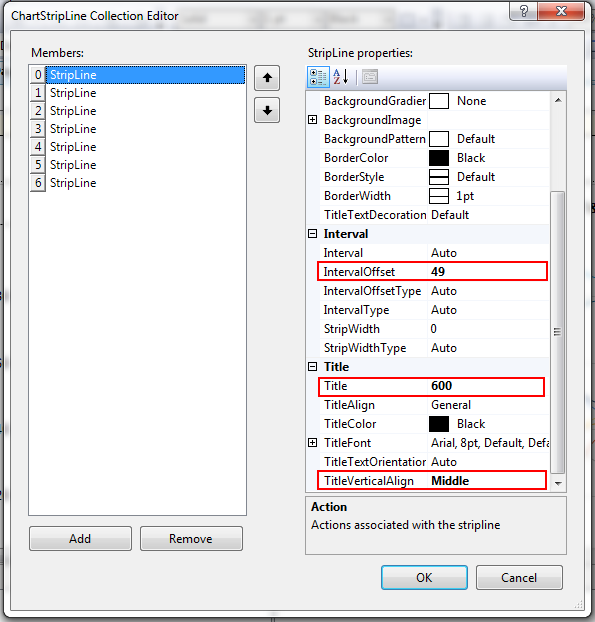 I thought that I would be able to use a formula to specify the axis values, however, this isn’t possible in SSRS. 50 = 600, 100 = 1200, 150 = 1800, etc. Ensure that your list goes higher than the maximum possible value buy at least one value. StripLines. If you don’t know what striplines are, they are basically horizontal lines drawn across your chart at a fixed Y value (I use these for showing targets, etc). They have a number of properties such as width, colour, title, etc. We are going to cheat and use these to add our additional values. 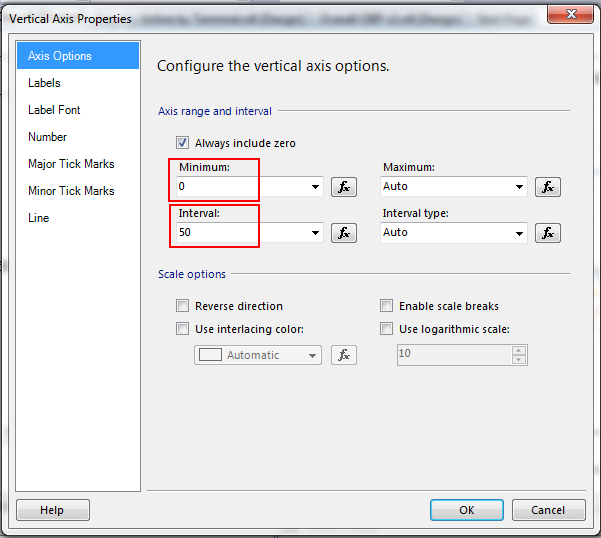 To access the striplines you need to click on the Y axis and then use the Properties window, note that striplines are not accessible via Right-clicking on the axis and selecting “Vertical Axis Properties”. 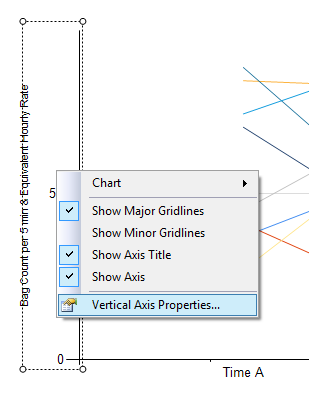 If you can’t see StripLines in the properties ensure you’re in the Chart Axis properties and not the Chart (or other section). IntervalOffset is the value on the Y axis where you want the StripLine to appear*. Title is the equivalent value. *One thing you’ll notice is that I’ve subtracted one from the IntervalOffset value, if you don’t do this the top StripLine will not be shown, so in my chart at the top the 2400 would be missing. As we haven’t set the Colour and thickness values for the StripLine it is invisible which is why you only see the values. Could be a little long-winded if you had a lot of values, but worked for me! 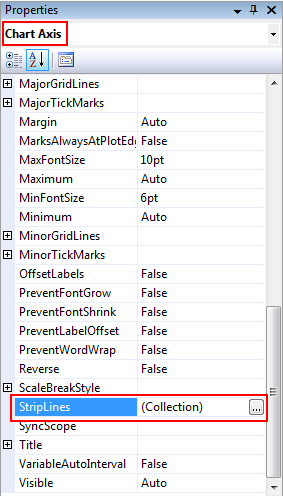 This entry was posted in Programming and tagged reports, sql server, SQL Server Reporting Services, SSRS. Bookmark the permalink.